In January of 2003, we founded PJO Insurance Brokerage, an independent insurance agency, with a single purpose in mind: that the first priority of our agency would be to service our clients with superior customer service, making absolutely sure the client’s needs were always above the agency’s, and ensuring that our clients received the proper commercial insurance program to fit their company’s needs. At PJO Insurance Brokerage, our brokers take the approach from the viewpoint of our clients, making sure we thoroughly understand what their insurance concerns are and putting forth an insurance plan that will fit their company’s and industry’s needs. An important advantage that PJO Insurance Brokerage can provide for its clients is that we are an independent agency, and we are not obligated to a single carrier, which means we can present our clients with many more insurance options and carriers so our Las Vegas and Clark County, NV clients will have the proper coverage for their business. We feel it is advantageous for our clients to have numerous insurance options, rather than being limited with just one option for their Nevada business. The experienced brokers at PJO Insurance Brokerage in Nevada have over 55 years of combined insurance experience and only draw on the finest resources available with a commitment to perform at a level above the rest, thus, ensuring our clients have the proper insurance products with a level of personal attention and superior customer service previously unmatched. Our professional brokers at PJO Insurance Brokerage understand that no two businesses are the same with each and every one needing its own set of insurance requirements. So, if your Las Vegas/Clark County, NV business has been operating for years, or if you are just starting down the entrepreneurial path, PJO Insurance Brokerage has the expertise and resources to handle your commercial business insurance needs. With our access to many of the country’s finest AM Best-rated insurance carriers available, we are confident that we can provide your company with a vast array of business insurance policies and coverage options to fit most Las Vegas and Clark County, NV business needs. 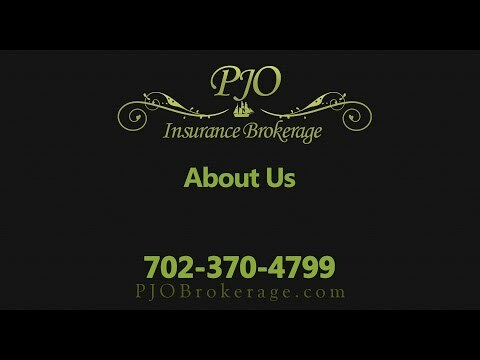 PJO Insurance Brokerage has numerous markets for several insurance coverages which include Nevada General Liability Coverage, Product Liability Coverage, Property and Inland Marine Coverage, Directors & Officers Liability Coverage, Las Vegas Errors & Omission Liability Coverage, Employment Practices Liability Coverage, Cyber Liability Coverage, Professional Liability Coverage, and NV Workers’ Compensation Coverage. These insurance coverages are just a fraction of the coverages PJO Insurance Brokerage has to offer their clients. Also, for those hard to place risks such as roofers, welders, and certain new ventures, our agency has insurance markets that will provide coverage options for these types of risks. PJO Insurance Brokerage will spend the time necessary to learn as much as possible about our clients’ businesses and the risks involved, so in the end, we can present an insurance program tailored to their insurance needs because our first priority is our client. By taking the time to review the client’s operations, we can be better informed to present the client with several insurance options that will assist their company in having the proper coverages should a disaster or claim happen to them. If you would like to see how having professional experienced brokers handling your Las Vegas/Clark County, NV business insurance program can benefit you, please call PJO Insurance Brokerage today to allow our experienced brokers to go to work for your business, ensuring that your insurance needs are met with proper coverages and with customer service second to none. We look forward to working with your company in the near future.